JoJo has been playing indoor soccer in this big dome for the last three years, and all three years he was with three different clubs. 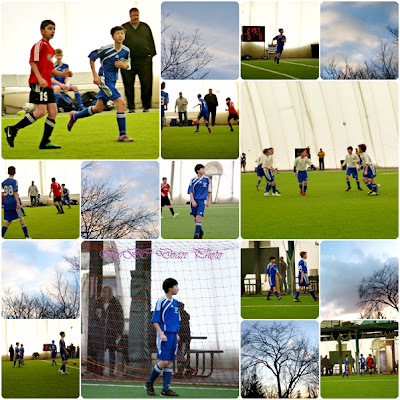 This is the one sport that he loves, and it is a way to keep him active during the winter. I still haven't figure out how to take proper pictures of fast action movement yet, but have tried different settings such as aperture mode, speed mode, programming mode, and also manual mode. Now, once I could find a perfect combination for light, action, and click, I would be so happy. My goodness! How he's grown. Has he had a growth spurt recently? He looks almost like a teenager. It's good there is an indoor place to go during the winter. That's a relatively new thing for most kids. JoJo looks a lot taller suddenly and more mature, he's a very handsome young man. And how wonderful that he can play soccer in the winter, nice picture mosaic! That makes a lot of sense, indoor soccer dome.